As an open source project, DNN relies on our community to help improve the product. In the past year we have placed renewed emphasis on getting the community involved in core platform development. Whether it is by fixing small bugs which may have special significance to a community member, or by submitting major platform enhancements, the community is really starting to embrace this new role. Since moving to GitHub in 2013, the community has submitted 114 different pull requests of which 84 have already been reviewed and accepted. These pull requests have come from 28 different community contributors representing both long-time community participants as well as a couple of relative new comers. 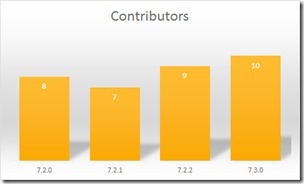 In every measurable way, the DNN community is improving it’s level of participation from release to release. 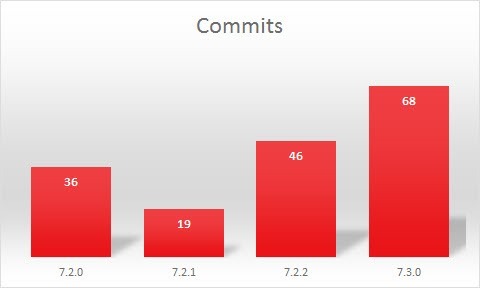 As you can see in the graphs below the community made a significant contribution to DNN 7.3.0 which included 29 separate pull requests, 68 different commits and 168 different files that were changed. 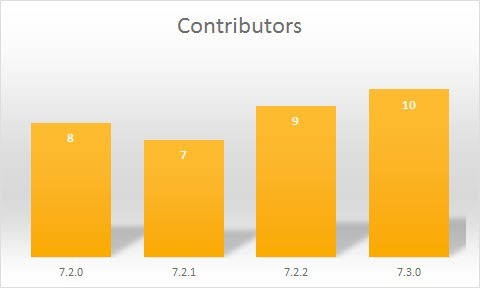 These contributions were submitted by 10 different community members, including a few first time contributors. 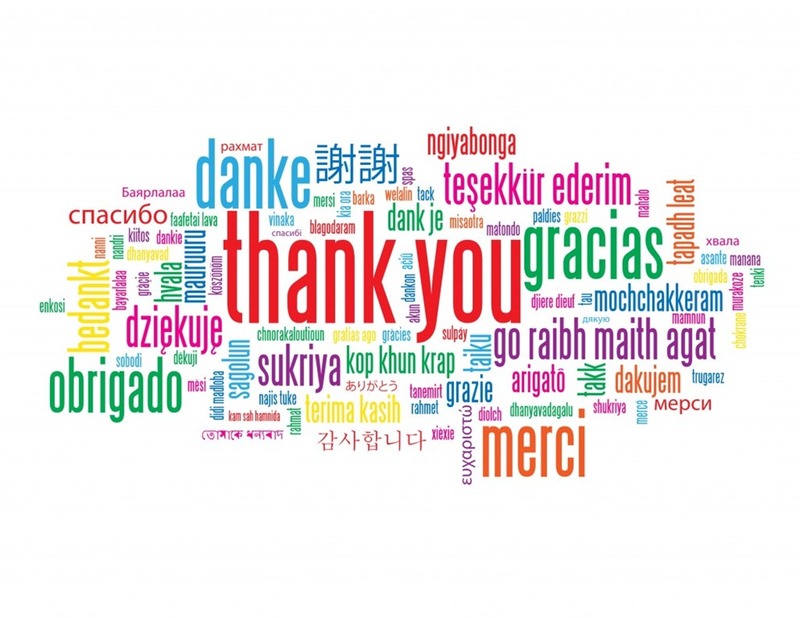 I want to take a moment to thank all those community members who submitted code changes for DNN 7.3. Their efforts helped create a better platform for everyone and I hope to see their contributions continue with upcoming releases. 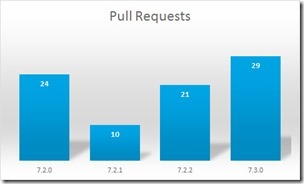 You can see a full list of pull requests that have been submitted by the community on the DNN GitHub repository. Going forward, we’ll work to recognize contributors with every release. It has taken a bit of effort to pull all the data together as GitHub does not provide any sort of consolidated report to make this easy, but now that the initial work has been done it should be easier to organize this data for future releases. If you are a coder and haven’t submitted a pull request yet, I would urge you to take a look at the list of outstanding bugs in our issue tracker and see if there isn’t something that you could help fix. 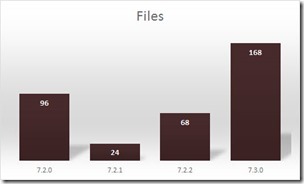 With your help we can make future versions of DNN even better than our previous releases. UPDATE: For a full rundown on all the features in DNN 7.3, checkout the upcoming webinar "What's New in DNN 7.3"
Thanks to all contributors. Is there a way to know who is currently working on a certain bug? It would seem like a wasted effort if two developers picked the same bug to work on. I am guessing the chance this happening is pretty slim (based on the number of previous contributors and number of current open bugs). Forgot my settings contribution ? 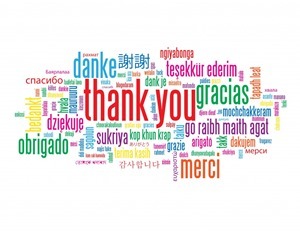 A big thank you to all those that contribute to the DNN platform. Your volunteered time to improve this CMS is greatly appreciated! I didn't break it down by individual pull requests, but just show a list of contributors and your name is definitely included. I'm guessing there are quite a lot of people out there in DNN land that would be willing to help but are no quite sure how to get started. Wold it be possible to put together a quick "How To" guide for developers that want to help out. It should cover the basics like 1) How to get set up with GitHub 2) How to assign a work item to yourself 3) How to check the solution in and initiate a pull request, etc. I'd be willing to bet we could increase community participation quite a bit with a little bit of hand holding to get them started.